When Jin Park ’18 was growing up in New York City, his family always told him to be mindful of his surroundings, to keep quiet about being undocumented, and to avoid busy streets where he might encounter immigration agents. Park can relax somewhat now because he can remain in the United States under President Obama’s 2012 Deferred Action for Childhood Arrivals (DACA). President Trump, a vocal critic of illegal immigration, nonetheless has affirmed the policy that keeps such students here and in school. Still, Park worries about family members and friends who aren’t covered by such a policy and may face the threat of deportation down the road. The Trump administration has promised to toughen enforcement strictures on U.S. immigration policies and to tighten the nation’s borders. Park is one of four undocumented Harvard undergraduates who spoke with the Gazette about their challenges, their concerns, and their hopes under the new administration. Here are their everyday lives, in their own words. “After that, I wanted to keep things quiet, but I continued to study hard. When Obama announced DACA in 2012, he singlehandedly changed my life. Without DACA, I’m vulnerable. DACA helped me walk without fear because I was protected from deportation. I applied to 34 schools. I knew that some schools were not going to accept me because I was undocumented. 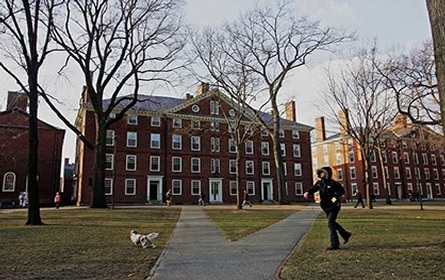 When I was accepted to Harvard, my parents felt it was a validation of our lives here. For them, it was like, ‘This is why we came here; this is why we went through all the things we went through.’ Every day, they tell me how proud they are of me. “I hope the administration doesn’t pull families apart, and people will be more willing to understand the complexity of immigration. It’s not only a security issue or a Mexican issue. No one talks about Asian undocumented students. I don’t expect people to know. If I weren’t undocumented, I wouldn’t know how broken the immigration system is. I hope that people understand that a wall is not the solution. “I was born in Colombia. I came here when I was 3 years old. I grew up in Connecticut. I knew I was undocumented while growing up. My parents didn’t drive because they didn’t have a license and couldn’t afford a car. My first memory of being undocumented was when I was in first grade. It was a rainy day, and I had to attend a school concert. We walked to school, and I was late and drenched. I was supposed to be in the front row, but because I was late I was put in the back. It was a horrible experience. “I was not supposed to talk about our status. I couldn’t even tell my best friend about it. Many people assumed that I was documented. When I was a freshman in high school, someone asked me if green cards (given to U.S. permanent residents) were green. I didn’t know, but I said yes, they were green. I lied and felt bad. When DACA came out, I was in my last year of middle school. It opened a lot of doors and offered me protection from deportation. I felt invincible. I felt that no one could touch me because I was lawfully here. “After my status was legal, I felt comfortable engaging in activism, and I got involved with Connecticut Students for a Dream. I went to a meeting and shared my story. It was empowering. At my high school graduation last year, I was the valedictorian and gave a speech about my being undocumented, because I wanted to show how much you could accomplish even though you may be undocumented. I had the highest GPA in my class, and because of my grades, I thought they were enough to overcome the barrier of being undocumented. But the difference between applying for college as an undocumented person and a documented person is huge. “Because of DACA, I thought we were moving in the right direction. Now it seems that we’re going backwards. Now I’m O.K. because I can get through college, but I can’t study abroad, which is really sad. I’m hopeful that an opportunity will come along, that I can figure out a way. I may get a work visa after graduation. But I’m not sure about my life. “I was born in Peru. I came here at age 6. I grew up in California. My uncle lived there, and when the economy got bad in Peru, he persuaded my dad to move there. Growing up, I felt I had two lives. School was a very good place where I felt really happy, and everything was stable. Then I’d come home, and there was always insecurity about work and finances. When I was little, I thought the problem was money, but when I asked my parents why they couldn’t get a job that paid more, they told me we why. They told me we had to be cautious. “It’s hurtful being undocumented because you have to hide an integral part of your identity. I had the feeling of being stuck. I was excelling at school, but I didn’t see any pathways for me. I did well there because I liked it, but also because I didn’t want to cause more anguish to my parents, who were already struggling. In 2008, when the recession hit, my dad lost his job, and we went through hard times. That’s when I truly realized my life was different from others. I had to make up excuses to my friends because I couldn’t do things with them, either because I had no money or I had to take care of my little sister. My father worked at anything he could; my mom was a helper in a nursing home. When my parents kept losing their jobs due to the recession, we started moving from place to place. “Growing up was hard. I felt I couldn’t win no matter what I did. You go through your life hearing about immigration reform, year after year, and you go through disappointment after disappointment. When the Dream Act initially failed in 2010, it was a huge letdown. When DACA came out, I was a sophomore in high school. It was a huge deal, surreal. I couldn’t believe it. It was at last an opening. When the news came out, my mom asked me to explain it to her. It was big, at least for us, the kids, if not for the parents. My mom was happy to see that her children’s lives could improve. My dad encouraged me to apply to Harvard. He said, ‘I have faith in you.’ And when I was accepted to Harvard, he freaked out, and so did I. With my coming to Harvard, both my parents felt their sacrifice had paid off, but they had never come to campus. “I was born in Mexico. They brought me in a truck when I was 6 years old. My parents crossed the desert later, and we moved to Nebraska, where we put down roots. I was always aware of our legal status because my parents told us to be cautious and stay out of trouble and avoid drawing attention. I’ve always loved school. I’ve always wanted to go to college, even though people said I didn’t have any chance because I didn’t have papers. My dad works as a landscaper, and my mother cleans houses, and they’ve always encouraged me to go to college. I had amazing teachers in middle and high school who knew about my status and encouraged me to keep thinking about college. “As I got older, I realized the odds were against me. The system wasn’t designed for people like me. But that little, brown, undocumented kid inside me kept saying, ‘You should apply for college.’ In high school, I had an amazing counselor, Antonio Perez, who changed my life. He helped me realize what I needed to do to go to college. I had to work 100 times more than the other kids. So I did. “My senior year in high school was hard because my dad was placed in deportation proceedings. One day, ICE (Immigration and Customs Enforcement) agents came to our house looking for a relative who was living with us. They arrested him and they also took my dad, who opened the door. Around that time, I became a DACA recipient, but it was scary. I had to go to the same ICE office that was going to take my dad away. I was worried about giving all my information to the government. I also wondered what the catch was, and why it was that I could be protected from deportation but not my parents. It didn’t feel safe, but now I realize I’m in a much better position as a DACA recipient. “Around that time, I also got involved with activism. With a group of Dreamers, we lobbied against a bill in Nebraska that prevented young undocumented immigrants with college degrees from obtaining professional and commercial licenses. We wrote to senators, worked with the community, and we got the bill changed. “My dad was supposed to be deported in my senior year, but his hearing kept being delayed, and he was able to be at my high school graduation. It was one of the happiest days of my life. When I was accepted to Harvard, I was flabbergasted. My parents were very proud. We didn’t have money to fly, but my dad wanted to see his kid off to college. He said, ‘It’s a memory we have to have.’ We rented a car and drove from Omaha. It took us two days. “My dad’s legal situation still worries me. He had a hearing on March 1, but he’s safe for now. I’ve always wanted to go back home after graduating from college, but if my dad were deported, I might not have anything to go back to. Since President Trump was elected, I’ve been dealing with so much pain, frustration, and helplessness. It was hard to focus on homework when my family could have been taken away. I kept asking, ‘How am I going to get through this?’ And more importantly, ‘How are they going to get through this? My father’s hearing keeps being delayed. I don’t know if he’s going to be deported. These interviews were edited for content, clarity, and length.